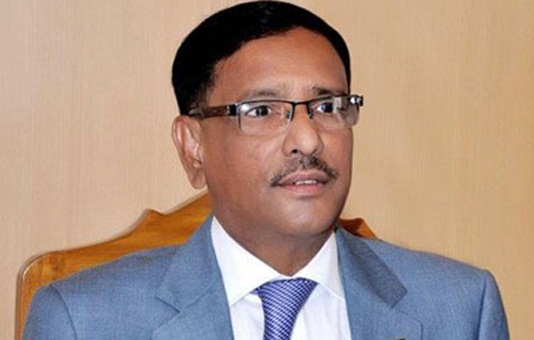 Awami League General Secretary and Road Transport and Bridges Minister Obaidul Quader on Saturday said destructive politics of Dr Kamal Hossain and his followers is now on the brink of ruination. “Disguised and destructive politics of Dr Kamal Hossain and his followers has marked one step forward towards ruination. Electoral history enunciates that those who would boycott elections would definitely face the political fate of isolation from the people,” he said. Quader came up with the remarks at a press conference at AL President’s political office in the city’s Dhanmondi area. His remarks followed a statement made by Jatiya Oaikyofront leader Dr. Kamal Hossain. “We have to overcome some mistakes and shortcomings before institutionalizing the democracy completely. The democracy will take institutional shape holding elections one after another,” he said. AL Office Secretary Dr Abdus Sobhan Golap and central executive committee member SM Kamal Hossain were present at the press conference, among others. Speaking about the immediate past by-polls to Dhaka North City Corporation (DNCC) mayoral post, the AL general secretary said presence of the voters was low due to inclement weather on the election day. But turnout increased in the afternoon when weather improved, Quader added. The minister asked those, who are out to spread slander about the DNCC polls, to observe the coming Upazila Parishad election by visiting different areas. Referring to BNP regime, he said, “Sadek Hossain Khoka was elected mayor of the Dhaka City Corporation unopposed just after the national polls in 2001. Then, the people were barred to submit nomination papers for contesting the election”. The AL general secretary added: “But there were no obstacles during this mayoral election. BNP could submit nomination papers. We did not bar anyone from contesting the national and local government elections”.